Dublin Airport is warning passengers passing through this Christmas not to wrap presents, as they may be opened at security. Snow globes are not permitted in hand luggage, due to their liquid content, it adds - though Christmas cakes and puddings are good to go. The tips are among several issued (see video above) by the airport as it gears up for its busiest Christmas ever, with over one million passengers expected to arrive and depart between December 22 and January 5 - up 2pc on last year. “Friday, December 22, is expected to be the busiest day before Christmas, with almost 85,000 passengers," revealed spokesperson Siobhán O’Donnell. "December 29 is expected to be the busiest day after Christmas, particularly with passengers heading to winter sun and skiing destinations,” she added. Over the festive season, the airport is hosting almost 1,000 performers from local schools and choirs, while terminal decorations include over 100 trees and 100,000 LED lights. Ryan Tubridy will broadcast from the airport on Friday, December 22. 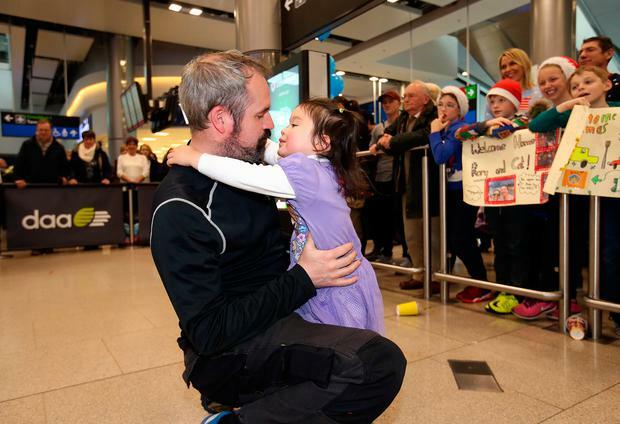 “Over the years we have had a number of Christmas marriage proposals, and every year we have grandparents seeing their grandchildren in the flesh for the first time," O'Donnell says. Many friends and family dress up for the occasion. Aer Lingus, Emirates and all US carriers operate from Terminal 2, while all other airlines operate from Terminal 1. 2. Don't wrap that present! If you are planning to bring Christmas gifts by air this festive season, Dublin Airport is asking passengers not to gift wrap presents. "Many passengers take a lot of care and time to wrap Christmas gifts for family and friends overseas. We would ask them not to wrap these gifts otherwise they may be disappointed if they are requested to open them at the passenger security screening area," says Siobhán O’Donnell. Snow globes cannot be carried in hand luggage due to liquid content, but Christmas cakes and puddings can be taken through. EU aviation liquid regulations are still in place, so passengers are reminded to pack gifts in bottles or containers measuring more than 100ml into their checked in luggage. Passengers are also reminded not to carry sharp objects in their hand-luggage, such as, scissors, nail files, blades, corkscrews, cutlery or other sharp objects of any description. These objects should be packed into checked in luggage. 5. Christmas crackers are okay! Christmas crackers may be brought through the passenger security screening area provided the novelty gifts inside are not sharp/prohibited items. Passengers should plan to arrive in the terminal building at least 90 minutes before their flight departure time irrespective of whether they are checking in online or at the airport. Those flying long-haul are advised to consult their airline's website for check-in times. Road users should allow extra time to get to the airport in the event of traffic congestion to ensure they comply with check-in and airport security regulations. Dublin Airport will close on Christmas Day – the only day on which it closes every year - although a number of staff and emergency services remain. Flight operations will cease on Christmas Eve after the last flight departs at 23.10 to Chisinau with Air Moldova, and resume on St. Stephen’s Day. Aer Lingus’ EI 104 from New York lands at 5am on December 26. 21 tips from Ireland's savviest travellers - make a real difference to your next trip!